In an other article called Yoga and Horses, we explored the similarities between a yoga practice and effectively communicating with your horse. In this discussion we explore the importance of lifting your arches while performing asanas and while riding your horse. Lifting your arches is probably the simplest and safest way to maintain correct alignment between your ankle and knee while performing asanas, whether standing, sitting, prone, or supine. Correct alignment means fewer injuries and strain to the knees. Our knees carry 85% of our total body weight and they are essential to our ability to walk and stand. In riding our knees have a different function. Lifting our arches while riding helps to maintain correct position of the lower leg. We are thus able to more precisely give leg aides to our horse. When our ankles and knees are in correct alignment our hips are free to be more open and supple. An open free moving hip, as all riders have experienced, makes riding not only more comfortable but makes it easier to give leg aides to our horse. From the perspective of the rider’s safety and comfort a correctly aligned lower body means fewer knee strains as they post to the trot, assume jumping position, and ride all gaits from their seat. of lifting the arch in almost all asanas. By simply rolling the ankles gently towards one another you engage numerous muscles found in the feet and bring into correct alignment the ankle and knee. You also activate the inner thigh muscles, a muscle group often neglected but vital for balance. Further, uneven development of the outer quadriceps muscle group in relation to the inner thigh muscle is a factor in knee strains and injuries. Your knee should never be in a position of strain or pain. If after lifting your arches you feel discomfort in your knee bring your focus to your hip. A tight hip joint causes the knee joint to have limited range of motion. The Warrior series of poses are excellent for opening up the hips and offering opportunities to practice lifting the arches in both the front and back feet. Your yoga practice on the mat will enhance your riding comfort and ability to effectively communicate with your horse through your leg aides. In addition to the Warrior series of asanas Triangle pose and Revolved Triangle pose are also great hip openers and strengtheners. All standing one legged balance poses present wonderful opportunities to lift the arch and strengthen the standing leg. Seated poses and poses done while lying down on the mat lend themselves to lifting the arch. Let’s look at Dandasana. In Dandasana the legs are outstretched in front of our bodies. If we consciously lift the arches our legs automatically straighten bringing them into correct alignment from ankle to knee to hip. We also strengthen the quadriceps and allow the hamstrings to fully extend without causing strain on our knee joints. In Locust pose, while lying on our stomachs we can lift the arch of both feet, thus bringing into alignment the entire leg. The same action is experienced in Bujangasana. Another pose that lends itself to lifting the arches is Pawana Muktasana. Feel the difference in your knees and hips as you perform all these poses. In the riding community we say that to learn to ride you have to spend time in the saddle. The same can be said about yoga, to learn yoga asanas you simply have to spend time on your yoga mat. With awareness lifting the arches will become an ingrained habit. If this is not yet a comfortable habit for you try performing your Sun Salutations with an extra emphasis on lifting your arches in each element of the sequence. 1. Tadasana - lift the arches and relax the toes. 2. Back bend - lift the arches, firm the thighs and buttocks. 3. Forward Fold - lift the arches; be aware of your balance over both feet evenly. 4. Lunge - lift the arch of the bent knee and be conscious of your knee to ankle alignment. 5. Plank - lift the arches and extend the heels away from your body. 6. Cobra - lift the arches, toes relaxed on the mat. 7. Downward facing Dog: lift the arches, be aware of the alignment from ankle to knee to hip joint. 8. Lunge - lift the arch of the bent knee; don’t forget your back leg’s alignment. 9. Forward fold - lift the arch and continue to do so as you rise out of your forward fold and into Tadasana once again. In the saddle we can practice the same awareness of the position of our feet and arches.With your foot in the stirrup purposefully roll your ankle slightly towards the inside of your horse. You will feel your leg lengthening, your inner thigh muscles engaging, and the position of your hip opening slightly. You will also find yourself sitting taller and more squarely on your seat bones. Lifting the arches helps to stabilize your riding position. In a walk be aware of your foot, leg and seat position. When this is comfortable try trotting and maintaining the lifted arch position of your feet. Experiment with changing directions and up and down transitions between walk and trot. With your lower leg in correct alignment from your ankle to your hip your leg aides and signals are more easily transmitted to your horse. In the canter your position is more secure with the arches lifted because you have more contact with the horse’s body from your seat and down your inner leg. The lessons learned on your yoga mat can easily be translated to your relationship with your equine friend. 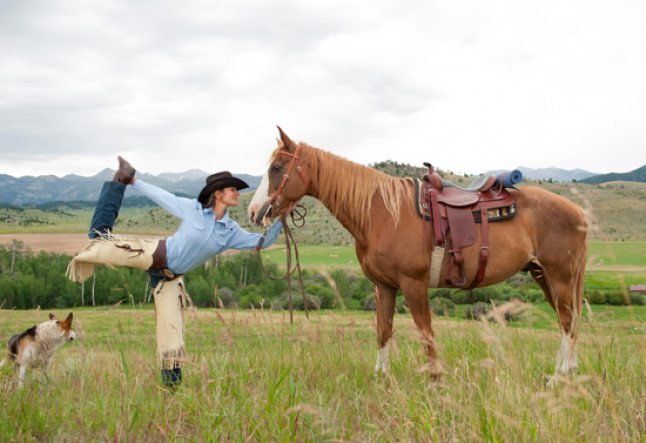 Let yourself explore and expand your yoga practice to include how you ride and communicate with your horse. The joy and peace you feel on the yoga mat are the same joy and peace you feel in the saddle.